CryptoGod ransomware is a new iteration of the Hidden Tear malware that encrypts data with the .payforunlock extension. Our complete CryptoGod Ransomware removal guide will guide victims on restoring their computers and recovering all affected files. How Does CryptoGod Ransomware Infiltrate the System? According to the available research the hacker or hacker collective behind the CryptoGod ransomware originate from Italy. It is very likely that the first attack campaigns to target people located in the country before moving to a worldwide infection attack. The Hidden Tear malware family has seen thousands of variants and they all use varied strategies. In the case of the CryptoGod virus we suspect that the hackers are going to use the most popular and effective ones. They include the use of email spam messages that contain social engineering tricks. The CryptoGod ransomware is attached to template emails that pose as being sent by legitimate and well-known companies or government institutions. The dangerous virus can be attached directly or linked in the body contents. The hackers may also opt to include a payload code in infected office documents or software installers. The virus is downloaded when the computer users interact with the file. Some anti-virus products cannot effectively detect such infection attempts, this is why we advise everyone to use a quality anti-spyware solution. Browser hijackers can be used to deliver the CryptoGod ransomware. They are malicious browser add-ons that seek to redirect the victims to a hacker-designated third-party site by changing the default home page, search engine and new tabs page. In addition they harvest sensitive information such as any stored account credentials, history, cookies, bookmarks, form data and etc. The creation of counterfeit download sites and torrents is another way of distributing the virus. The hackers can rename the file to make it appear as another software. Malware experts discovered a newly constructed iteration based on the Hidden Tear core malware. It is known as the CryptoGod ransomware and it originates from a prior sample called “MoWare H.F.D”. It follows the same behavior patterns associated with most other viruses that are descendant from Hidden Tear. Effectively it targets a total of 666 extensions that include a wide range of file types: documents, archives, backups, music, photos, videos, configuration files and etc. All affected files are renamed with the .payforunlock extension. encryption and locked with unique key, generated for this computer. pay and obtain the private key. Caution: Removing of CryptoGod will not restore access to your encrypted files. Now you have the last chance to decrypt your files. 3. Transaction will take about 15-30 minutes to confirm. The lockscreen not only prohibits ordinary computer interaction and contains instructions on how the victims can pay the hackers for file decryption. We strongly advise all affected users not to pay them, as the transactions done through the Bitcoin digital currency cannot be traced. 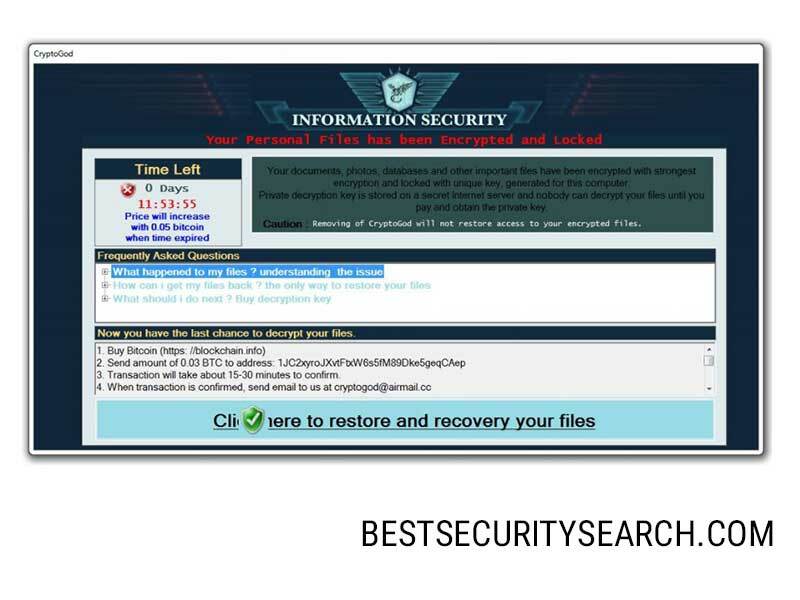 To restore infected computers users can use a quality anti-spyware solution in combination with a professional-grade data recovery product. The ransomware sum is specified in Bitcoins. The initial sum is relatively low compared to other Hidden Tear samples. The hackers behind the CryptoGod ransomware demand 0.03 BTC which is equivalent to about 85 US Dollars. A short time limit is enforced. If the victims do not pay within the displayed time frame the price will increase with increments of 0.05 Bitcoins. The computer criminals behind the CryptoGod ransomware offer detailed information about the infection. Computer victims may be persuaded to pay the fee if they read the instructions or contact the hackers. In addition the malware is able to conduct several system modifications. The CryptoGod virus engine can manipulate running processes via the Task manager and also execute arbitrary commands sent by the hackers. Combined with a ready-made network infrastructure can result in an effective Trojan ransomware. The CryptoGod ransomware therefore can spy on the users, recruit the infected machines into a worldwide botnet and infect it with additional malware. WARNING! Manual removal of CryptoGod Ransomware requires being familiar with system files and registries. Removing important data accidentally can lead to permanent system damage. If you don’t feel comfortable with manual instructions, download a powerful anti-malware tool that will scan your system for malware and clean it safely for you. WARNING! All files and objects associated with CryptoGod Ransomware should be removed from the infected PC before any data recovery attempts. Otherwise the virus may encrypt restored files. Furthermore, a backup of all encrypted files stored on external media is highly recommendable.